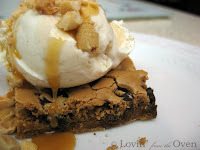 Frieda Loves Bread: Blondies Have More Fun! 0 Blondies Have More Fun! I just can't get enough of these...warm, gooey, nutty....hey! 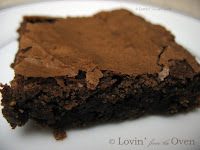 I'm describing my absolute favorite brownie: the Blondie! I'm not sure how this brownie came by, but I think it was because someone ran out of....dare I say it?.....chocolate. Or cocoa. But this cousin lives up to her carmely goodness. Is 'carmely' a word? It is now! Our family got together to celebrate 5 birthdays that happen during November. Now, most of us are adults and don't mind celebrating together. A nice, simple change of pace to the cake/ice cream combo is to serve brownies and ice cream with your favorite toppings. Grease a 8x8 baking pan. In a medium saucepan, heat brown sugar and butter over medium heat till sugar dissolves, stirring constantly. Cool slightly. Stir in eggs, one at a time (quickly, before they cook). Add vanilla. Stir in flour, baking powder, and baking soda. Okay, now I feel bad for the lone chocolate brownie...I'll post its recipe tomorrow!